Transformation Yoga Project serves people impacted by trauma, addiction, and incarceration through trauma-sensitive, mindfulness-based yoga programs driven by education and research. We have active programs running concurrently in numerous facilities throughout the greater Philadelphia area including addiction treatment centers, prisons and VA hospitals, as well as, community programs hosted at local yoga studios and community centers. Each program is tailored to the specific needs of the participants and staffed by instructors trained to teach trauma-sensitive yoga. We also provide special training for yoga teachers and committed yoga practitioners interested in working with people who have been impacted by trauma. In 2009, a guilty plea to a misdemeanor landed Mike Huggins in prison for nine months. As he marked the slow passage of time within the confines of prison, Mike struggled to cope mentally, physically and emotionally. Surprisingly, the yoga he had practiced and taught some years before became his salvation. 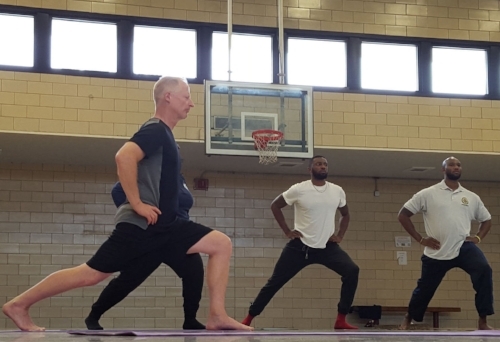 With this new understanding of the power of mindfulness-based yoga, Mike began a grassroots effort that evolved into a comprehensive yoga program within the prison. 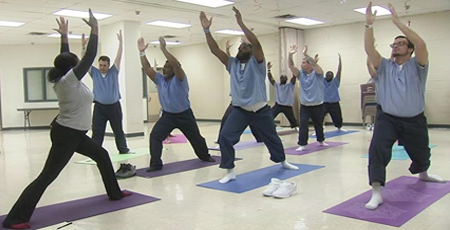 This yoga program at the Lewisburg Federal Prison Camp offered its participants many benefits including impulse control and coping mechanisms for anger, antisocial behavior and substance abuse problems commonly reported among incarcerated populations. The common yoga themes of self-acceptance and self-compassion were embraced. Upon his release in 2012, Mike founded the Transformation Yoga Project to bring yoga to people facing difficult circumstances. The Project has expanded to training others how to bring the meditative practice of yoga to those within the justice system, veterans and those struggling with addiction. Mike’s mission is to provide helpful tools for dealing with stress, tension, addiction, and anxiety for people who would otherwise not have access to yoga. Mike has dedicated his time and passion to demystifying yoga by breaking down the powerful and positive aspects of the practice in a straightforward manner that at-risk populations can relate to. Mike remains active in teaching yoga in addiction recovery facilities and prisons hospitals as seen in the Huffington Post, as well as PBS, ABC, CBS, Fox and NBC News affiliates. He is the author of Going Om: A CEO’s Journey from a Prison Facility to Spiritual Tranquility. He is also a contributor to several books focused on best practices for teaching trauma-informed yoga and mindfulness to under-served populations.